Court ladies preparing silk. Produced with ink and colors on silk. Silk is the precious material that brought considerable wealth and prestige to China. Silk cultivation is said to date back to the time of the legendary Yellow Emperor, when the Empress Leizu herself cultivated silkworms. Thereafter at the start of the agricultural year the Emperor each year plowed a ritual furrow and the Empress made a ritual offering of mulberry leaves and silkworm cocoons. Archeology has produced silk fragments from Neolithic times and all dynasties since, it was for many centuries unique to China. Silk has been used for paintings and for writing as well as clothing, as it is soft and retains dyes. Silk was so precious that it was for a long time used as a form of currency. A 'bolt' of silk had a standard length and value (roughly 22 inches [56 cms] wide 41 feet [12 meters] long). Together with silver, silk was often used as a payment to appease neighboring kingdoms. When sea trade with China grew in the Ming dynasty, silk was one of the main exports - it was light weight, non-perishable and of high value. 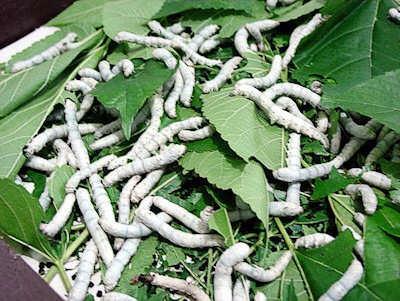 The art of silk cultivation was kept as a closely guarded secret by the Chinese for many centuries, Pliny the Elder (23-70CE) believed silk was collected by caterpillars from plant hairs rather than spun into a cocoon. The character for silk is 丝 sī - a pictograph of a coiled up silk worm. It is often used as a radical in other characters for example silk fabric is 绸 chóu and some colors (from the use of dyes), red 红 hóng and green 绿 lù. 绪 xù rather pleasingly combines the idea of ‘silk’ and ‘old’ to produce the character for ‘clue’ (following a thread) and ‘ancestry’ (following the family line). 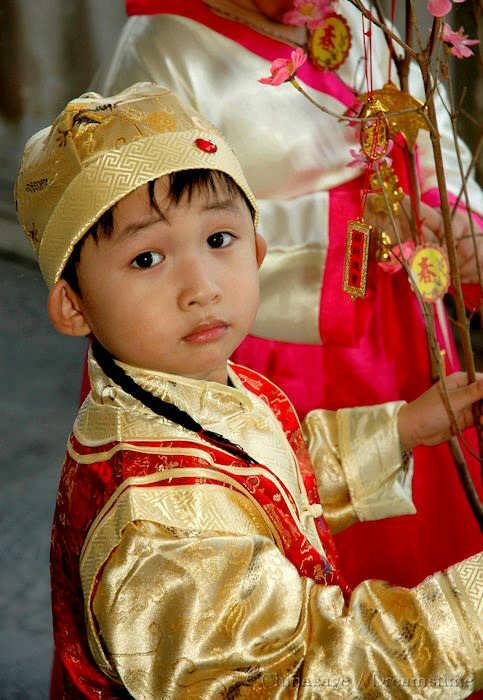 Silk represents purity and virtue and is associated with the divine weaver Qi Nu. The Romans prized the fine, thin cloth and the Silk Road provided an overland route for the export of silk. The raw silk thread was transported to Damascus in Syria where it was woven into cloth, and hence ‘damask ➚’ 绫 líng as a name for silk. Queen Cleopatra of Egypt fueled the fashion by wearing fine silk dresses. The Romans spent so much gold on importing Chinese silk that Emperor Tiberius ➚ forbade the wearing of silk by men. The land from where silk came from was called ‘Serica ➚’ derived from the Chinese word for silk. The English name ‘silk’ is believed to come from Old English ‘sioloc’ which in turn came from Greek ‘serikos’ so silk is one of the very few English words with an origin in China. The production of silk is called ‘sericulture’. Young silkworms, the caterpillar of the silkworm moth Bombyx mori ➚, are put on straw mats in April and are fed mulberry leaves for a month. Mulberry leaves are picked and fed to them several times a day. When ready to pupate they are placed near straw bundles where they take four days to spin their cocoons. After eight days to let the thread harden the cocoons are separated out and put in boiling water to kill the pupae. The cocoons are then unwound to make a long, single thread ready for weaving into cloth. A single cocoon can yield a mile of silk thread. For strength, six or more threads are spun together into the yarn. The yarn is then ready to be dyed. It takes 9 pounds [4 kgs] of leaves to produce every 0.4 ounces [10.0 grams] of silk. Some pupae are allowed to develop to adult moths in order to generate eggs for the next brood. The female moth lays around 500 eggs over five days. This permits up to five cycles of production to be completed within the growing year of the mulberry tree. Cats were so essential to keeping the rats from eating the silkworms that they were often known as 'silkworm cats' 蚕猫 cán māo. Originally silk production was a cottage industry with each family (predominantly the women) manufacturing small amounts of silk. The finest silk was produced in the south, in the north a coarser off-white product was made from oak rather than mulberry leaves (in the wild the silkworm feeds on oak rather than mulberry leaves). Mulberry produces a rubbery sap and it is probably this constituent that helps the silkworms produce robust, flexible fibers. A strict code on the clothing of court officials required them to wear dyed and decorated silk. Cheaper and rougher hemp or cotton was the clothing of the mass of the people. Satin is often made from silk and has a glossy top surface and a matt back produced by a different weaving pattern. 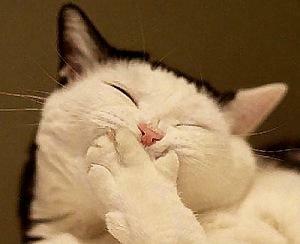 [Satin is named after Zayton, an ancient name for Quanzhou in Fujian province]. Zhejiang province has a long tradition as a center of silk production dating back at least 1,500 years. Hangzhou and Suzhou were the main centers; Suzhou has silk and embroidery museums. By the Tang dynasty porcelain began to overtake silk as the most prized Chinese export. 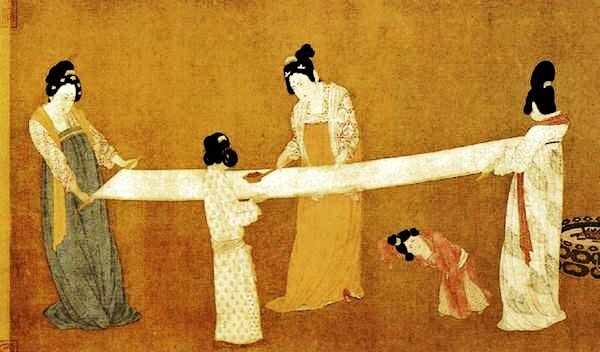 The secret of silk manufacture was closely guarded, but by 200BCE the technology had found its way to Japan and Korea. It took a lot longer to reach the Byzantine Empire ➚ (600CE) where a silk industry at Damascus ➚ had been weaving silken cloth for centuries. An unlikely story relates how silkworm eggs were smuggled out of China in a hollow stick ➚ by Nestorian monks inside a hollowed stick around 550CE. By the 13th century silk production was started in Italy after crusaders brought back silk producers after the fall of the Byzantine Empire. In 1608 King James I ➚ of England issued an edict to start up a silk industry in Britain and its colonies. Unfortunately the Black Mulberry ➚ (Morus nigra) tree was planted while silkworms feed on White Mulberry ➚ (Morus alba), but in any case it is not likely that the silkworms would have coped with the cold climate. A number of mulberry trees planted at the time of the Royal proclamation are still alive including one at Christ's College Cambridge ➚. Citation information for this page : Chinasage, 'Chinese Silk', last updated 2 Dec 2016, Web, http://www.chinasage.info/silk.htm.